wasn’t going to be easy. Guest Column, Nick Smith, Executive Director of Healthy Forests, Healthy Communities. Using your GPS, you can determine the latitude and longitude, which is written on the sign. The Associated Logging Contractors (ALC) is selling the signs for $12.50 plus $1.00 for the stickers that go on the sign. (Shipping is included in the price.) For more information, call 1-800-632-8743. The Montana Logger reported that Montana’s Legislature established the third week in October as Montana Forest Products Week, appreciating the locally-made wood products, forest stewardship, employment in the forest products industry, and access to public and private forests. This year’s events will run October 17-25. The kickoff event will be a three-day Habitat for Humanity Blitz Build in Stevensville organized by the Society of American Foresters (SAF). The SAF is currently looking for volunteers to work the event — from swinging hammers to donating logs. There will be mill tours and open houses in St. Regis, Seeley Lake, Clancy, Deer Lodge, Missoula, Reid Point, Ashland, and Stevensville. There will be also be Chamber of Commerce Timber Tours in Kalispell and Missoula. Other events include a Walk in the Forest in Anaconda with the Deer Lodge High School and Walk in the Woods for 4th-8th graders from Ashland School. If you would like foresters graduating from the University of Idaho to be more familiar with logging, you can help out by donating your used equipment. All donations are tax deductible. The wish list for the forest operations program and Student Logging Crew includes: shop tools; medium to large excavator; self-loading truck; feller buncher; stroke or danglehead processor; rubber-tired grapple skidder; tracked skidder; swing yarder or yoder; and more. If you’re interested in donating, please contact Rob Keefe at (208) 310-2069 (robk@uidaho.edu) or Steve Hacker at (208) 885-7400 (shacker@uidaho.edu). 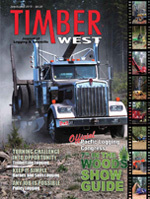 In 2003, Oregon OSHA adopted Division 7 safety and health rules for forest activities, which included new requirements for all operator protective structures (cabs) on machines manufactured on or after July 1, 2004. The requirements incorporated ISO and SAE standards to help ensure operator protection from materials handled and roll-over/tip-over hazards. Oregon OSHA later extended the 2009 compliance deadline to July 1, 2014 to give companies more time to cycle out their older machines.